The difference between the adjusted data and the measured data in the NOAA’s US temperature data set. Almost a year ago, I wrote about a problem with the National Oceanic and Atmospheric Administration’s (NOAA) temperature data. It seems that for at least some weather stations in their network, automated adjustments to the data have been inserting a warming trend where the actual data show no such trend. This, of course, is a problem, since these data are often used to analyze claims made by scientists in the global warming debate. Further investigation of this issue has led to even more concerns. Consider, for example, the graph at the beginning of this post. It is produced from the data at the United States Historical Climatology Network (USHCN). The graph shows what you get when you subtract the raw data (what is actually measured) from the adjusted data (what is actually displayed) for several of the temperature stations in the network. If the adjustments had no overall effect on the trends given by the raw data, the graph should show a line that wiggles above and below zero. From 1900 to about 1940, that’s roughly what you see. During that time period, then, we can be fairly confident that the adjustments aren’t affecting the overall trend given by the data. Notice what happens after about 1940, however. The difference rises significantly as time goes on. What does that mean? It means the adjustments are increasing the temperature data more than decreasing them. 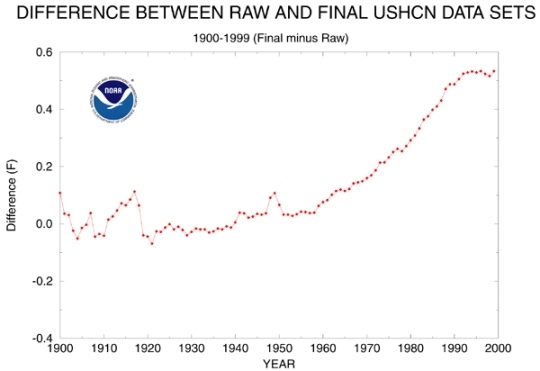 In other words, the adjustments are making the more recent years hotter than the raw data indicate they were. In addition, the more recent the year, the warmer the adjustments are making it seem. This, of course, is a troubling result. The USHCN’s data are often used to show that the average temperature of the U.S. has been increasing over time. However, if the above graph is accurate, at least some of that warming trend is not the result of actual measurements. It is the result of adjustments that have been made to the data. Now please understand that the very nature of the USHCN makes adjustments necessary. The data come from a system of weather stations, and the problem with such a system is that every once in a while, there is a glitch. Sometimes, there is a power outage at a station. Sometimes, there is a communication error. Sometimes, the station is down for maintenance. As a result, there are times when the station doesn’t report any data at all. This would be a problem, because it would skew the data. To fix this problem, there is a computer code that estimates the temperature that the station would have sent if it had been sending data at the time. This is necessary to keep missing data from causing a problem, but if the estimate is severely wrong, the “fix” might be worse than the missing data. If the graph at the top of this post is accurate, it seems to me that might be the case. Of course, it’s quite possible that the graph overstates the problem or is fundamentally incorrect. As a result, the Global Warming Policy Foundation is launching an inquiry into these data. This organization, a think tank in the UK, has been openly critical of those who suggest that global warming (AKA “climate change” AKA “climate disruption”) will produce catastrophic problems for humankind. Thus, it is not a neutral party in the global warming debate. However, if you look at the panel of scientists who will lead the inquiry, they obviously have the necessary qualifications to investigate climate-related data. Hopefully, they will be as unbiased as possible and get to the bottom of this issue. In addition, they plan to investigate data sets from around the world – not just U.S. data sets. I am simply using the U.S. data set to illustrate the problem they are investigating. Regardless of your views on global warming, its cause, and its possible effects, I would think you would be in favor of such a review. After all, a graph like the one at the top of this post is quite troubling. If we are ever going to understand global temperature and how people might be affecting it, we must have solid data upon which to base our conclusions. If the data are unreliable, our conclusions will be unreliable as well. For the sake of climate science, I truly hope the inquiry gets to the bottom of this issue. They need to come clean and open-source the code they use to supply estimates of missing data. There are many thousands of software developers and data scientists around the world who could analyze the code in a fairly objective manner, to see if they are following acceptable standards or using defensible algorithms. I have a question: given the interrelation between space and time postulated by the theory of relativity, how do we square off a big universe with little time (hundreds of thousands of years old)? Thanks for the question, Francesco. Relativity actually explains why we can see a big universe from an earth that is only thousands of years old. General relativity tells us that time doesn’t tick at the same rate in different parts of the universe. Instead, the rate at which time ticks depends on the local gravitational fields. In large gravitational fields, time ticks slowly, while in low gravitational fields, time ticks more quickly. If you believe in the cosmological principle (which seems to be violated on all scales), then you say that on average, the gravitational fields are essentially the same everywhere, so on average, time ticks smoothly throughout the universe. Thus, if we see light from a star that is 500 million light years away, it took roughly 500 million earth years for the light to get to us. However, if you take a more reasonable view of the universe, you have to come up with some sort of model that explains how gravitational fields vary throughout the universe. For example, if we assume the universe’s expansion is spherical (which is not what the big bang assumes – it assumes no geometry to the universe’s expansion), you will find that time ticks very slowly near the origin of the expansion and very quickly near the edges. Thus, if earth is near the origin of the expansion, thousands of earth years correspond to billions of years near the universe’s edge. A general explanation of this can be found here. That idea has been picked up by a creationist cosmologist and expanded.